Is there a better alternative to Midi Mock? Is Midi Mock really the best app in Audio category? Will Midi Mock work good on macOS 10.13.4? Midi Mock Midi Mock is a virtual Midi keyboard that allows you to generate Midi note events through your Mac keyboard or by mouse-clicking on it. It can be used to send Midi note events to external Midi synthesizer modules connected to your Mac and software synthesizers, and it provides visual feedback of the notes being pressed. 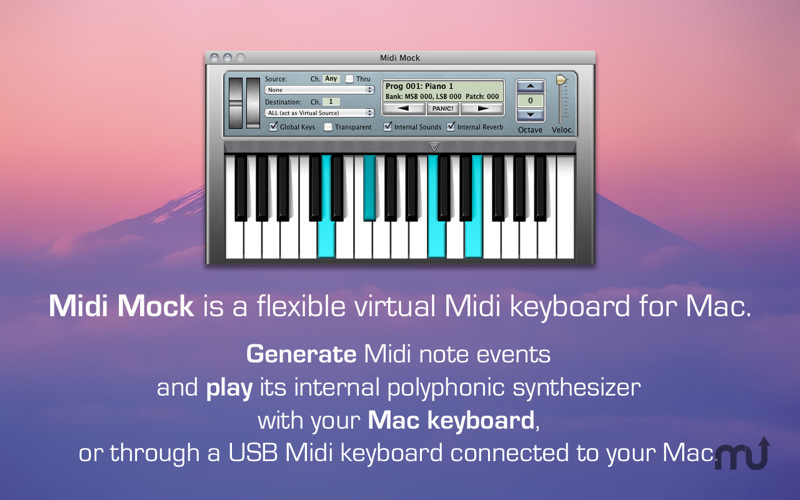 Midi Mock can also be used as a polyphonic synthesizer on its own, to play the built-in Mac DLS sounds either through the Mac keyboard or by connecting a USB Midi keyboard to it. Midi Mock needs a rating. Be the first to rate this app and get the discussion started! It has mouse-operated pitch-bend and modulation wheels, octave transpose buttons, a velocity slider and a "global hot keys" option that will capture keypresses also when Midi Mock is not the frontmost application on your desktop. The physical position of the keys will be the same on any keyboard layout, but they may correspond to different letters and symbols depending on the specific country layout. The arrow keys are mapped to the functions of internal sound program increase and decrease (right, left) and octave transpose (up, down), with autorepeat.